This article assumes you have at least basic knowledge of linux, know how to use the shell, and most importantly, you host your site on your own VPS. The installation is quite simple. I will show you through the step by step installation OwnCloud 8 on Ubuntu 15.04. Step 1. First of all log in to your server as root and make sure that all packages are up to date. Step 2. Instal Apache web server on your Ubuntu 15.04 VPS if it is not already installed. Step 3. Next, install PHP on your server. Step 4. Install MySQL database server. Step 6. Installing Owncloud 8. First we will need to download the latest stable release of OwnCloud on your server (at the time version 8.1.0). Step 7. Configuring Apache for OwnCloud. Step 8. 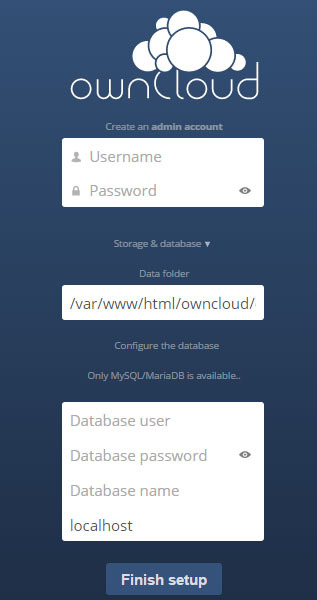 Access OwnCloud application. Congratulation’s! You have successfully installed OwnCloud. Thanks for using this tutorial for installing OwnCloud 8 on Ubuntu 15.04 system. For additional help or useful information, we recommend you to check the official OwnCloud web site. Related Posts of "How To Install OwnCloud 8 on Ubuntu 15.04"